The 15th edition of ICAR - The International Catastrophic Risks Forum, taking place in Bucharest, Romania, on 9 October, touches issues of paramount concern. Insurance Europe - the European insurance and reinsurance federation, called for a two-year delay in IFRS17 implementation to address the 11 issues that were identified during the tests performed by EFRAG - the European Financial Reporting Advisory Group. "Romanian insurers paid claims totaling 30.5 million RON in the first 6 months of 2018 in the household insurance segment", explained Adrian MARIN, President, UNSAR, during ICAR - The International Catastrophic Risks Forum. The Latvian insurance market totaled EUR 386 million at the end of June 2018, with an 18% increase y-o-y. At the same time, insurance companies paid EUR 200 million in claims (12% more y-o-y). 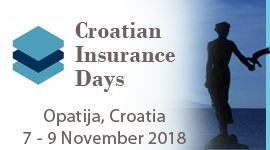 The 2018 edition of the "Croatian Insurance Days" will be held in Opatija, Croatia, on November 7-9, 2018. Organized by the Croatian Insurance Bureau, with the support of the Croatian Ministry of Finance, the conference will have, as usual, a rich and very informative program, also providing for extended networking opportunities. Italian group GENERALI launches a new Cyber Insurance function and a fully-owned technology start-up, GENERALICyberSecurTech to address customer concerns and needs in the area of cyber risk. Aon's Impact Forecasting team launched the latest edition of its monthly Global Catastrophe Recap report, which evaluates the impact of natural disaster events that occurred worldwide during September 2018. The second GENERALI Global Agent Excellence Contest took place in Sorrento to elect the best agent within the GENERALI Group. During the Grand Finale Sergio SCHENA, from GENERALI Italia, was voted as Group's best agent. On October 5, 2018, the rating agency S&P affirmed "B/B" long- and short-term foreign and local currency sovereign credit ratings on Belarus with a stable outlook, as the Finance Ministry of the Republic announced. 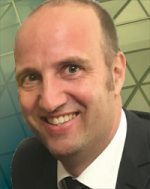 The supervisory bodies of Deutsche Ruckversicherung AG and the Association of German Public Insurers decided today, to appoint Achim Bosch (53) to the executive board of the two reinsurers, where he will be responsible for non-life reinsurance. CROATIA osiguranje Group (CO Group) - one of the largest insurers in the Adriatic region announced this summer on the Zagreb Stock Exchange website changes in its Management Board. AVIVA announced Mark WILSON and the Board have agreed that Mark is stepping down as CEO of the group. "Mark will remain with the group until April 2019 and will assist with the planned and orderly transition". Willis Towers Watson - WTW - announced the appointment of Pamela THOMSON-HALL as the Head of the Central and Eastern Europe, Middle East, and Africa (CEEMEA) region. 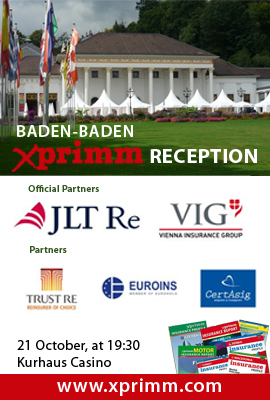 Five new titles will be available this year on the XPRIMM Baden-Baden press stands opened in the Kurhaus Casino and in Baden Baden main locations, presenting the latest statistical data and comprehensive analysis for the CEE, SEE and CIS insurance markets. There is just one month to go until the event hosted by The International Center for Insurance Regulation (ICIR), dedicated to the latest market and regulatory developments for the insurance markets of the Western Balkans. Swiss Re's Reception, hosted on September 27 by the Swiss Embassy in Moscow, was a great opportunity to hear and discuss about latest trends and opportunities in product development both on Life & Health and Non-Life side. Speakers have also looked at the regulatory environment and exchanged on the learnings from other countries. On this occasion, Wolfgang SCHWEHR, Market Head Russia & CIS, Swiss Re, shared with XPRIMM his views on different topics related to the Russian market.